I knew I wanted to be a pro cyclist when: I never grew up with the idea that I wanted to be a cyclist. I think it might have been somewhere deep in the back of my mind but I never woke up one day thinking that’s what I wanted to be. It was something that came slowly to me over the years. Greatest racing memory: I think it was winning the red number for being the Most Aggressive Rider at the 2014 Tour de France. That was the moment that I really felt that I was capable of peforming at the highest level. At that Tour I was a bit surprised, but I was confident that I could do something big and do my job in the best way possible without necessarily focusing on results. Race I dream of winning: Winning any race is good but a dream of mine is to win a stage in each Grand Tour. For the moment, I have just focused on the Vuelta a Espana, but that is definitely my goal. If I wasn't a pro racer: I’m not sure to be honest, but I think it would still be something related to sport. Alessandro De Marchi has been a professional rider since 2010 and is known for being one to watch when it comes to breakaways. He has proven time and again that he is an aggressive rider capable of winning on his own as well as being a key domestique. The Italian has three Vuelta a Espana stage wins to his name, the most recent in 2018 after an impressive breakaway performance. De Marchi followed this up with another strong solo performance at Giro Dell’Emilia which saw him secure a special victory on home soil. In 2016 he posted his best result in a Monument when he took on Il Lombardia and finished ninth. 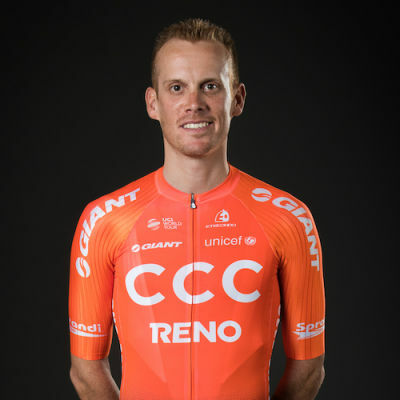 In 2014 he was the Most Aggressive Rider at the Tour de France and won the King of the Mountains Jersey at the Criterium du Dauphine.